A beautiful waterfall setting is waiting for you far away from the noise of the city. Watch the eye-pleasing scenery surrounding this enchanting wonder of Nature. Listen to the melodic sounds of the waterfall bubbling by and see the fish rushing up and down the stream. This is not just another slide-show or simple flash screensaver. The whole setting was built in 3D from scratch and the quality of animation can rival that of Disney. Get away from the noise of the city and enjoy this enchanting wonder of Nature. *Find refuge near a beautiful waterfall! Can you smell the fresh humid air filled with the majestic aroma of lush grass? Let your screen take you to this quiet place. 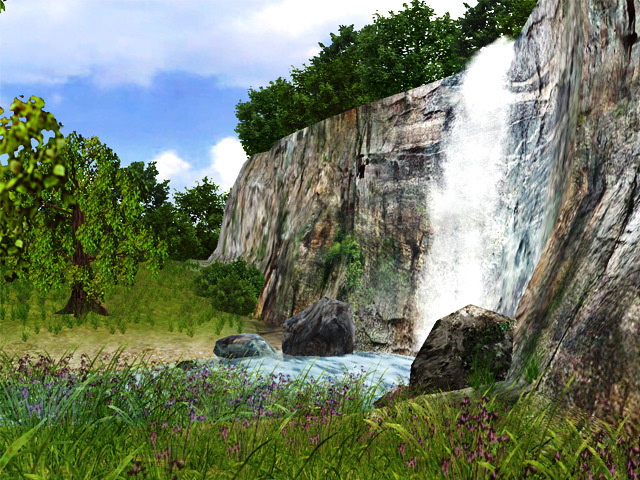 Relax and unwind with this serene yet uplifting forest waterfall screensaver. Waterfall Slideshow Screensaver is one of nature's most captivating sights! Shows a variety of beautiful and powerful waterfalls. Qweas is providing links to 3D Waterfall Screensaver 1.1 as a courtesy, and makes no representations regarding 3D Waterfall Screensaver or any other applications or any information related thereto. Any questions, complaints or claims regarding this application 3D Waterfall Screensaver 1.1 must be directed to the appropriate software vendor. You may click the publisher link of 3D Waterfall Screensaver on the top of this page to get more details about the vendor.